When sizing up a weighing application there are many options to choose from. With modern technology and the advancements in A/D converter technology the performance of a typical weighing system is surprisingly good. With so many choices out there, how do you narrow it down? There are basically two technologies, the more common “Strain Gage” technology and the “Electro Magnetic Force Compensation” system. Both have their place in the weighing industry and sometimes it is a tough call to decide which way to go. For most applications the strain gage is the obvious choice because of the lower cost, simple design and ease of maintenance. Strain gage load cells are usually held with a few screws so removal and replacement is quite simple. For tank or process weighing systems the strain gage load cells are often contained in “mounting kits” that allow them to move slightly and reduce the unwanted output caused by side forces. Most applications will use either flexible mounting kits or rigidly mounted load cells. Let’s review the basic strain gage technology- The strain gage is a sensor that has a certain elasticity to it that will allow it to deform without breaking. The sensor is a precision resistive bridge element with four connection points. An excitation voltage is applied across two of the elements. The other two elements are used for the output. When there is no strain on the element the resistance is perfectly balanced so there is no current flow through the bridge. When weight is applied, there is an imbalance in the resistance and current will start to flow and develop a voltage across the output of the bridge. The typical excitation voltage supplied by the indicator is between 5 and 15 volts. The output voltage is usually in the range of 1, 2 or 3 mv/V depending on the manufacturer and load cell design. This output signal will be amplified and then applied to the A/D converter in the indicator producing a digital output to be displayed on the indicator. What type of results can you expect from this type of technology? For a platform scale with a strain gage load cell of type “C3” you can get anywhere from 10 to 50 thousand divisions of the full capacity without too much trouble. If the environment is good you can probably get a higher resolution, but only when coupled with an indicator capable of higher resolution in the A to D converter. The other type of technology is “Electro Magnetic Force Compensation” sometimes known as “Force Restoration”. In this type of system there are several technologies at work. 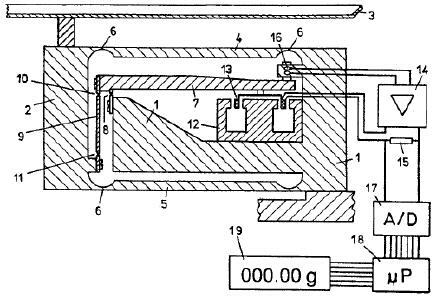 Similar to a load cell there is a flexible mechanism (1), but much more complex. If you look at the precision machined flexures (6) you will see that it is quite flexible, unlike a load cell. Without any load on the pan the system is at equilibrium. When weight is applied the distance between the force transmitting lever (7) and the optical position sensor (encoder) changes and the encoder sends a signal to the servo motor coil (13). The coil is located in the field of a permanent magnet. As a current is developed in the coil the increasing force in the magnet pulls the force transmitting lever back to its original position. A precision resistor (15) is in series between the servo amplifier (14) and the coil. The voltage developed across that resistor is fed to the A/D converter. Here the voltage is converted to a digital signal. The digital information is sent to the microprocessor and eventually to the Display. A “PID” algorithm is used in the control loop to speed up the response of the system. When you apply a weight to the platform you get a step function like in the example above. Since there is no servo loop in a strain gage system, the response may be under damped or over damped. It will take some time for the system to settle to a stable weight. 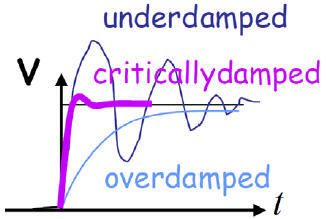 In a PID loop you get a “critically damped” (magenta) response. This results in a faster more stable readout. Since the deflection in a typical load cell is less than 0.5 mm the A/D converter has to really work hard to give a good signal across the weighing range so there is a limit to how many divisions you can get. A force restoration system is not limited by this, therefore, far higher resolutions can be achieved. The force restoration system has a much larger range of motion resulting in more A/D counts and higher resolution. Here are some things to consider when deciding between these two types of systems. As you can see there are pros & cons for each type of systems. In some cases the price / performance does justify the use of extremely high resolution systems. Weighing of gas cylinders- The container is very heavy (> than 150 kg.) but accuracy of < 1 gram is required. Dual Platform Counting – Extremely accurate determination of average piece weight used in conjunction with a lower accuracy bulk scale to accurately count. Science & Research- The long term monitoring of a sample where you do not want to see results affected by changes in temperature. Compression / Tension Testing- This is ideal because the effect of the servo system returns the weighing platform to the exact position prior to the application of weight. Hopefully this will help in selecting a weighing system for your next application.